Solitary and stoic, with a severe leaning toward introversion and quiet isolation, Annaliese is easily labeled aloof. Mostly polite and reserved, her pale eyes and thick, arched eyebrows compensate for frequent failures in verbal expression. She tends toward dry humor, close-mouthed smiles, and a gray moral compass. Her tendency to cut through the thick of things by means of overt bluntness is lessened only by her soft-spoken nature. Losses from the Calamity have taken their toll on her well-being and mental health, and its effects are, to her disappointment, often apparent. While exceedingly slow to anger, much like a long-burning fuse, her explosive temper has made some shows of boiling to the surface. Even years after making a life for herself on the surface, customs, cues, and interacting with above grounders sometimes escape her grasp. Even so, she possesses a natural knack for business and professionalism - as well as a well-nourished vengeful streak made more severe by oft-crippling stubbornness and pride. Despite impressions, she is a woman of intense, quiet feeling. Slow to trust but recklessly loyal, there is a softness beneath the chip on her shoulder and often pervasive awkwardness. ■ Rain. Calming, especially following a day in raucous Limsa Lominsa. She is similarly fond of the ocean, streams, and running bathwater. ■ Freedom. Commitment-phobic or simply a love for travel? it's difficult to say. ■ Music. More than she lets off. She often hums to herself while working and when alone. ■ Travel. Confined to the underground from her birth well into adulthood, she finds enjoyment in travel, as well as a measure of peace . ■ Racism. Enduring bigotry has made her a bit gunshy around Wildwoods in particular, and fear of appearing weak makes her seem standoffish and aggressive instead. ■ Shackles. Of any kind, particularly those around her wrists. ■ Crowds. Less about the number of people, more about the noise they create. ■ Prosperity. Once primarily interested in requisite comfort and stability, this has recently edged toward a desire for wealth - perhaps excessive wealth. ■ Belonging. Communication is vexing and difficult, but she craves a sense of kinship. ■ Wanderlust. Travel, seeing the land, experiencing the realm - or she's simply afraid of staying in one place. ■ Atonement. Anna's done her fair share of terrible things, and makes daily efforts to correct that and prove herself. It doesn't always work out. ■ Pragmatic. Business-like, no nonsense, practical. Simplicity is best in most dealings. ■ Steady. Even-tempered, calculating, and exceedingly difficult to enrage, she is calm under pressure. ■ Loyal. Recklessly so, nearly impossible to shake once it's won. ■ Meticulous. Detail-oriented and exacting, whether in the lighting of a cigarette or the proper use of a knife. ■ Stoic. Impassive and calm to some, emotionless and cold to others. She struggles to express herself in a way that suggests she's accustomed to frequent socialization. ■ Sensitive. Bright light irritates her pale, sensitive eyes. Crowded areas trigger auditory overload, tinnitus, and headaches. ■ Trauma. The Calamity's effect is lasting and slow-fading. It comes and goes, but sudden, loud noises still set her heart racing. ■ Vindictive. Betrayal and unkindness is corrected; an eye for an eye. ■ Work. Driven by ambition and desire for stability, she (too) often places work before health and safety. ■ Solitary. Prefers her own company. Quiet (or simply taciturn) and hard to know. ■ Smoking. Almost always. Smokes aggressively when nervous. ■ Awkward. Horrendously bad at non-verbal cues, both reading and providing, and often wrong in how she comes off to others. ■ Blunt. Not one for tact or niceties, she tends to cut through the thick of conversation or conflict. Tall and lanky at 6 fulms 4 ilms, Annaliese is tautly muscled and athletically built. Broad shoulders, a modest bust, and a streamlined body feed into a narrow hips. 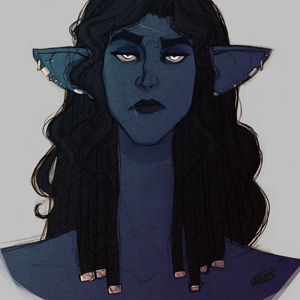 Scars riddle her dark skin extensively, though they are often obscured by armor and layered clothing. More easily seen, tiny cuts criss-cross her palms, long, callused fingers, and forearms. Her aquiline nose shows tell-tale signs of being broken at least once and is an arguably distinguishing feature paired with chiseled cheekbones. Arched, expressive brows frame deep set, intense silver eyes and a long, square face prone to withering stares and sly smiles, though her natural expression tends toward heavy-lidded and often squinting in light. Coarse, wavy black hair falls to the middle quadrant of her back. Most of it is managed into thick braids with metal clasps at their distal ends. Numerous silver piercings riddle her large, bat-like ears, along her cartilage. Ever the pragmatist, she dressses simply, favoring well-made, layered clothing: jerkins, plated gloves, sarouels, high boots. Her wardrobe is comprised almost entirely of dark, muted colors, earth tones, and shades of blue. SCARS: An old scar on her forehead that’s several shades lighter than her skin. A scar at the edge of her right eyebrow. A vertical scar runs just above the corner of her upper lip, nearly to her chin. Callused hands and fingers with tiny cuts on her palms, forearms, and fingers. Large, bat-like ears, pale eyes, severe eyebrows. Primarily a deadly practitioner of hand-to-hand combat, Anna is most comfortable with fist weapons or a pair of knives. She is equally proficient in using her body as a weapon, utilizing well-placed, quick strikes to vulnerable areas. With a style that is more speed and grace than power, her strength is, however, wielded with brutal efficiency when necessary. Though proficient in its use, she shies away from terribly heavy armor in favor of leather and layered cloth, with armored gauntlets or bracers and shin-guards. NOTE: Not all of Anna's in-game classes reflect her ICly. Despite having Black Mage nearly to level 50, anything magic-related is entirely OOC. I view her as a cross between Monk and Rogue, with few true Ninja qualities but breakneck agility. Any Monk abilities, such as opening her chakra and personal aether manipulation and environmental sensitivity, are unconscious. Most commonly used against armed or armored opponents. They are used to disarm and deflect blows as well as wound and kill. More generally her entire body, used in hand-to-hand combat or most situations. It allows her to more easily utilize her fists and grapple when necessary. She is not above fighting dirty when her life (or that of others) is on the line. Proficient with most types of blades, from swords to daggers and heavier arms. Anna favors a pair of daggers about as long as her forearm. While lacking in pure, brute strength, a lifetime of hard labor, toil, and exercise has toned her body. Flexible and acrobatic. Quick reflexes serve her well, but if she stops moving, dodging, or weaving, she’s liable to lose a few teeth or end up on the business end of a sword. 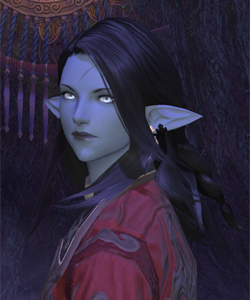 Brief: Annaliese hails from the deep underground far beneath the mountainous regions of Coerthas. Born into a long-fallen house of nobles, the product of centuries-old treason and plot, she and her family made their home in a series of well-carved, winding caverns, with a cave as their water source and bio-luminescent plants as their light. Her childhood and adolescence was spent doing backbreaking mining and excavating work, toiling alongside her family in near-servitude to another House. Most of her family (and much of her city) was lost in the Calamity from a resulting cave-in and rock slide. Whereabouts of any remaining relatives were and remain to be unknown, and the difficult years that followed led to Anna wandering toward Ul'dah as a refugee, scraping out a living pick-pocketing and raiding caravans until her eventual disentanglement from the city-state's underbelly. Present-day, she has since (seemingly) reformed and taken to honest work as a bodyguard, goldsmith, and general contractor of martial jobs. Recent involvements and a desire for wealth, however, would see this change. Some of these rumors are untrue, speculation, or are greatly exaggerated. Please feel free to add your own rumors under the Player Character category! ◢ COMMON RUMORS - Easily overheard. Use these freely! ■ "That one worked as a guard for my caravan, once. Good worker, but quiet. Too quiet, makes you wonder what's going on up there." ◢ UNCOMMON RUMORS - A little more difficult to hear. Use sparingly or ask first! ◢ RARE RUMORS - Very rarely overheard. Please ask before using! ■ "That Duskwight? Sure, she comes by sometimes. Stands and stares at a cliffside, pulls out a pick, starts whackin' away at it until some shiny shite falls off." ■ "Sellecerre? I have read it's an Ishgardian house. Well, a very old one. All sorts of bloody intrigue - I wouldn't ask anyone else about it." ◢ PLAYER CHARACTER RUMORS - Feel free to add rumors of your own! ● Annaliese’s solitary leaning, combined with a laxness toward sharing and an isolated upbringing, has made it difficult to build friendships. At least those not based around the exchange of gil. But damn does she try! Giselle Friloux ( ♥ ) - Lover. What began as an intriguing yet bewildering mix of attraction and animosity grew into something else entirely. Of late their relationship has become decidedly less ambiguous and borders on inseparable. Her passionate devotion is much more than she lets on, but her often reckless loyalty is clear. Renee Becquerel ( ✔ ) - Friend. Anna's relationship with Renee is odd. She met her as Renaud upon joining the Coral Sea, and has since considered Renee a pleasant, if occasionally bewildering, companion. Even if half of the time Anna has no real, concrete idea what in the hell she's saying. Georgette Friloux ( ✔ ) - Boss/Business Partner/???. A relationship just this side of fearful, Annaliese holds respect and a grain of fascination for Giselle's mother. Driven to her side to find work - and funds - to make a life for herself and Giselle, Anna has found herself slowly entangled in something that is increasingly larger than herself. It's yet unclear just how far she would go for her approval. Geissrael Helbmannwyn ( ✔ ) - ???. Little is known of Geissrael besides that she is Georgette's bodyguard. Recently, she's learned (as suspected) that they're also lovers. She fears her to some extent - largely because she knows she could snap her arm clean off and beat her with it. Sigurd Rainecourt ( ✔ ) - Friend. One of the first on the surface who Anna could truly call "friend." Recent news of his passing has saddened her. ■ The Ul'dahn and Limsan Underground. ■  - A Tumblr inspiration blog. NSFW and triggers are tagged. Updated semi-regularly. ■ Template adapted from Bancroft Gairn, with edits by Xheja Rajhera / N'hadiya Khei / Jajara Jara. Further edited and adapted by Annaliese Sellecerre. ■ Face claim is Antje Traue. This page was last edited on 5 March 2016, at 06:26.